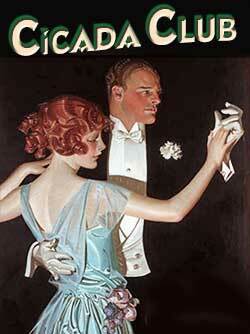 With the grandeur of a classic Hollywood musical from the thirties, The Cicada Club is a most unique experience that transports you back in time to the glamorous days of Hollywood's golden age of nightclubs. Featuring the finest dance orchestras and entertainment, The Cicada Club is unlike any night on the town you have ever experienced. Situated in the famed Art Deco Oviatt building, downtown Los Angeles' historic Lalique palace, The Cicada Club is a place fitting for experiencing an elegant romantic evening. Originally built as a top-of-the-line haberdashery in 1928, The Cicada Club retains much of the original design that the French designers and artisans of the time created. This spacious nightclub features fine dining on the main floor as well as the mezzanine that overlooks the entire club, an Art Deco mezzanine bar and lounge plus patio seating in the forecourt lobby.